Martin Daum: “2018 was one of the most successful years in the history of Daimler Trucks. As previously announced, our worldwide unit sales are significantly higher than in the previous year. With well over 500,000 trucks, we have achieved our highest unit sales of the past ten years. This success shows that we offer our customers around the globe strong products backed by an equally strong team. I would like to thank all my colleagues for their outstanding commitment over the past year. In 2019, we will continue pursuing the goal of making our customers – and ultimately society as well – more successful every day with innovative transport solutions. This also includes the technological transformation of our industry, which we are resolutely pushing forward with automated, electric and connected trucks." Daimler Trucks, the world’s leading truck manufacturer, achieved one of the best sales years in its history in 2018: Based on initial data, unit sales of the Mercedes-Benz, FUSO, Freightliner, Western Star, Thomas Built Buses and BharatBenz brands increased to well over 500,000 vehicles in 2018 (2017: 470,700). The exact sales figures will be announced by Daimler AG at its annual press conference on February 6, 2019. In a generally positive market environment, the Daimler Group’s trucks division had already increased its unit sales by eleven percent to approximately 466,900 units by the end of November, significantly more than in the same period of the previous year (January - November 2017: 422,500). “2018 was one of the most successful years in the history of Daimler Trucks. As previously announced, our worldwide unit sales are significantly higher than in the previous year. 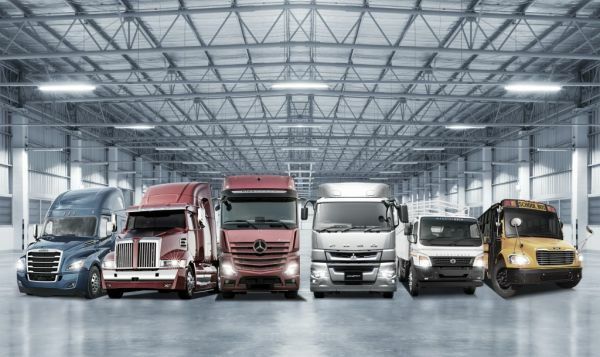 With well over 500,000 trucks, we have achieved our highest unit sales of the past ten years. This success shows that we offer our customers around the globe strong products backed by an equally strong team. I would like to thank all my colleagues for their outstanding commitment over the past year. In 2019, we will continue pursuing the goal of making our customers – and ultimately society as well – more successful every day with innovative transport solutions. 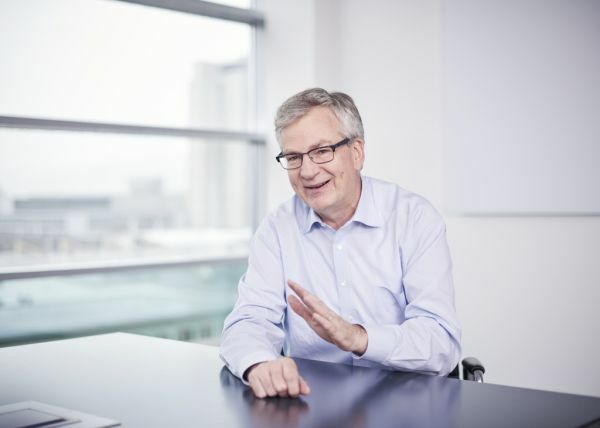 This also includes the technological transformation of our industry, which we are resolutely pushing forward with automated, electric and connected trucks.” said Martin Daum, Member of the Board of Management of Daimler AG responsible for Trucks & Buses. Most of Daimler Trucks’ largest sales markets developed positively in the past year, with the highest growth achieved in the NAFTA region. Sales of the Freightliner, Western Star and Thomas Built Buses brands increased by 15 percent to a total of approximately 172,700 units in the first eleven months (prior-year period 150,600). With a recent market share of 38.3 percent in weight classes 6 - 8, Daimler Trucks was by far the undisputed market leader for medium- and heavy-duty trucks in North America once again in 2018. Freightliner’s flagship, the New Cascadia, played a key role in the market success: More than 76,500 of this model have been sold since the start of production in late 2016. In June 2018, Daimler Trucks presented the heavy-duty Freightliner eCascadia and the medium-duty Western Star eM2, the first all-electric series-produced trucks for the North American market. The first vehicle, a Freightliner eM2, was handed over to the major US customer Penske Truck Leasing Corp. on December 20, 2018 for use in real customer operations. In the coming months, an innovation fleet of 30 all-electric trucks from Freightliner will be put into operation. Together with the Saf-T-Liner C2 electric school bus from Thomas Built Buses and the FUSO eCanter, Daimler Trucks offers the widest range of electric commercial vehicles on the North American market. 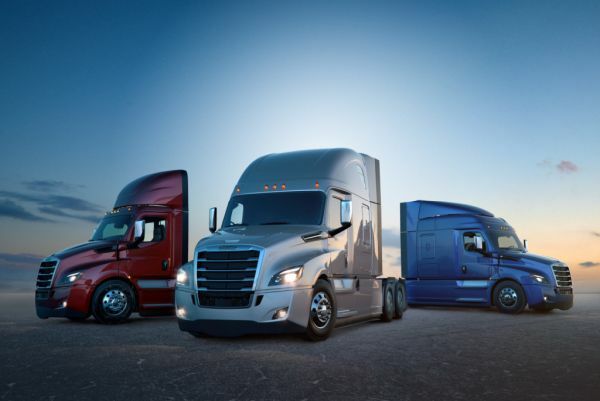 At the Consumer Electronics Show (CES) in Las Vegas on January 7, 2019, Daimler Trucks and Freightliner are announcing strategic news on the subject of automated and connected driving. Once again, Daimler Trucks is underscoring its claim to innovation leadership within the truck industry. At the same time, the company is also presenting its broad portfolio of electric trucks in Las Vegas, all of which are already on the road and in service with customers. In Asia, too, total sales rose significantly by 12 percent to 147,900 units (2017: 132,400). At approximately 40,000 trucks, sales in Japan in the first eleven months were roughly at the prior-year level (40,700). In its home market of Japan, the Asian commercial-vehicle subsidiary FUSO had a market share of 19.2 percent. FUSO’s heavy-duty flagship, the Super Great, benefits from the success of the global platform strategy – as do the latest heavy-duty trucks from Mercedes-Benz and Freightliner. In addition to a standardized electric/electronic architecture, the Japanese truck also uses the common drivetrain and this year will gain functionalities for partially automated driving (level 2). In the important Indonesian market, sales rose by a strong 52 percent to 57,400 units by November 2018 (prior-year period: 37,600). Customers in Indonesia have appreciated the trucks of market leader FUSO for more than 40 years. Since mid-2017, Daimler Trucks has also been offering Mercedes-Benz truck models there, which are mainly used as construction site vehicles. In India, sales were boosted by a significant recovery in demand for medium- and heavy-duty trucks. Daimler India Commercial Vehicles (DICV) sold approximately 20,500 trucks in the first eleven months, a significant increase of 35 percent compared with the same period of last year (15,200). Daimler Trucks also reached an important milestone in September 2018 with the production of its 100,000th vehicle at the Chennai plant. In addition to BharatBenz trucks for the local market, the plant in Chennai also manufactures models for export to more than 40 markets worldwide. No other western manufacturer than Daimler has successfully become established in India so far. In China, the world's largest market for commercial vehicles, Daimler holds a 50 percent equity interest in the joint venture Beijing Foton Daimler Automotive Co. Ltd. (BFDA), the manufacturer of Auman medium- and heavy-duty trucks. As expected, sales of 95,100 Auman trucks in the first eleven months were below the high level of the prior-year period (104,600). In 2017, the market had benefited not only from the favorable economic developments but also from regulatory measures for the renewal of the stock of vehicles. Since it was founded, the joint venture has sold more than 580,000 Auman trucks. In order to participate more effectively in the dynamic development of the Chinese truck market in the future, Daimler Trucks made personnel changes for its business in China in 2018. Since the beginning of 2018, Sven Ennerst has been responsible for all truck activities in China on the divisional board of management of Daimler Trucks. And in January 2018, experienced commercial-vehicle executive Kelley Platt took over the management of BFDA in China. In Latin America, Daimler Trucks significantly increased its unit sales in the first eleven months by 26 percent to approximately 34,400 trucks (prior-year period: 27,300). A significant contribution came from sales growth in Brazil, the region’s main market. At approximately 19,300 vehicles, sales there grew by 59 percent (prior-year period: 12,200). With a market share of 27.7 percent, the Mercedes-Benz brand was once again the market leader in the medium and heavy-duty segments. Despite the economic crisis, Daimler Trucks has systematically used the past two years to focus on the future – among other things, by comprehensively modernizing its production facilities. At the Sao Bernardo do Campo plant, for example, Mercedes-Benz put a state-of-the-art new truck assembly line meeting industry 4.0 standards into operation in 2018. In the so-called EU30 region (European Union, Switzerland and Norway), Daimler Trucks’ unit sales increased slightly by 4 percent in 2018. From January through November, about 76,200 units were sold (prior-year period: 73,600). Mercedes-Benz Trucks maintained its market leadership in the medium- and heavy-duty segments with a share of 20.4 percent. In Germany too, Mercedes-Benz continued to lead the truck market with a share of 36.0 percent. By the end of November, 29,100 vehicles had been delivered, an increase of 4 percent (prior-year period: 28,000). Mercedes-Benz Trucks expects further impetus from mid-2019 onwards from the new Actros, which was unveiled with numerous innovations at the IAA Commercial Vehicles Show in September and has been very well received. As the world’s most successful manufacturer of commercial vehicles, Daimler Trucks will continue pursuing its goal of setting the pace in the industry for automated, electric and connected driving in 2019. With the new Actros, Mercedes-Benz Trucks presented a vehicle to the public at the 2018 IAA Commercial Vehicles Show that has reached a new level in the heavy-truck segment with its technological innovations. The new Mercedes-Benz Actros with Active Drive Assist is the first series-production truck to enable semi-automated driving (level 2) on public roads. With Active Drive Assist, the new Actros can independently steer and brake, and significantly enhances safety in highway traffic by permanently monitoring its surroundings. Furthermore, an optimized drivetrain, the world’s first standard MirrorCam system instead of large side mirrors, and the latest generation of Active Brake Assist 5 make the new Actros one of the safest and most efficient trucks in its segment. In the field of electric driving, Mercedes-Benz has been handing over the first eActros trucks to its customers Hermes, EDEKA, Meyer Logistik and TBS Transportbeton since October 2018 in order to test their suitability for everyday use in regular transport operations. And around one hundred of the first all-electric FUSO eCanter light truck are now in service with customers in New York, Tokyo, Berlin, London, Amsterdam and Lisbon. In June 2018, Daimler Trucks brought together all its electric activities under the umbrella of the E-Mobility Group (EMG). The E-Mobility Group defines the strategy for all electrical components and complete electric vehicles across all brands and divisions. In addition, EMG is developing a globally uniform architecture, comparable to the successful global platform strategy for conventional drive systems and main components. Daimler Trucks is continuously working on further increasing the availability of trucks and buses. Digitization and connectivity play a crucial role here. Daimler is a leader in connecting commercial vehicles with approximately 600,000 vehicles already connected worldwide. The Truck Data Center is the heart of all connected Daimler Trucks services. This module is the technological basis for all connectivity services such as Fleetboard and Mercedes-Benz Uptime, as well as the telematics solutions: Detroit Connect for the Freightliner brand and Truckonnekt for FUSO. Like a modern smartphone, the Truck Data Center communicates via Bluetooth, mobile telephony or GPS with the infrastructure, other vehicles and other entities involved in the logistics process. Via the Truck Data Center, a Daimler Trucks truck is permanently connected to the cloud and becomes part of the internet of things.